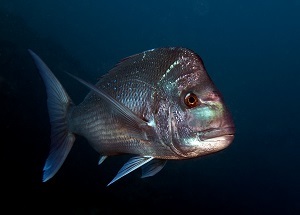 The Australasian snapper or silver seabream, Pagrus auratus, is a species of porgie found in coastal waters of Philippines, Indonesia, China, Taiwan, Japan, New Zealand, and Australia; its distribution areas in the Northern and Southern Hemispheres are disjunct. Although it is almost universally known in New Zealand and Australia as snapper, it does not belong to the Lutjanidae family of snappers. It is highly prized as an eating fish. The taxonomic status of this species is being debated, and it may be referred to as either Pagrus auratus or Chrysophrys auratus.